Sublime Shaw epic performed on a large scale with no expense spared on props, sets, costumes, extras and fake blood. Loosely based on the Mongol invasion of China, Ku Feng plays the marauding Lord Li commanding one of China’s many kingdoms with a little help from his sons, known collectively as the Thirteen Generals. Biblical assertions aside, it is Li’s drunk thirteenth son, played by David Chiang, who becomes the group leader after slaying Bolo Yeung with a big stick, leading his brothers into missions of intrigue and espionage. The Lord’s disciples come unstuck when two of the troop turn Judas and attempt to steal the glory, steering their Mongol faction headfirst into serious trouble with a rival warlord leaving their kingdom vulnerable to attack. 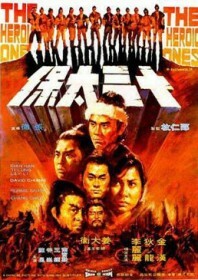 Chang Cheh laments his fallen brethren with plenty of gusto, particularly when Ti Lung dies defiantly defending his master and when David Chiang meets a horribly grisly end, even by Shaw Brothers standards. But when Chang Cheh isn’t dwarfing his lens with great colour and movement, he is asking strong moral questions of his audience; a title heavy in irony and a cast of characters who (aside from a few moments of jaded loyalty) seem to possess very few redeeming features. This successful film would set the trend for Shaw’s high concept direction into the 1970s and introduce a new team of talented actors and filmmakers with a fresh and exciting set of ideas.